Spa facilities and pool. So pleased the room had all the essentials kettle, free bottled water etc and most of all a fridge, this helped with having a toddler. 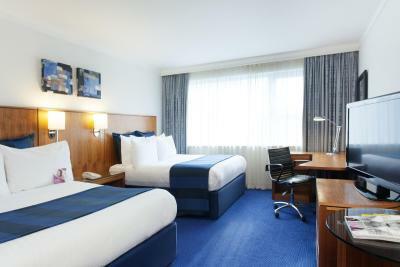 Huge room with comfy beds and friendly professional staff who went out of there way to meet our needs. bed not comfortable. Tv defective. room very office like Hotel lacked warmth, not as in heating but atmosphere. We liked the parking facilities. Food was good and a good selection for both breakfast and dinner. Would certainlyy stay again when next in the area. Losds of parking too which is great! The size of the rooms, the facilities within the room. Room was quiet. Good selection at breakfast. Good location easy parking very friendly reception a nice clean room bigger then normal hotel rooms with a practical approach ie bedside draws, wardrobe with a safe that you did not need to crawl on the floor to use. Crowne Plaza Marlow This rating is a reflection of how the property compares to the industry standard when it comes to price, facilities and services available. It's based on a self-evaluation by the property. Use this rating to help choose your stay! The 4-Star Crowne Plaza Marlow is located beside a lake, in the heart of the Thames Valley. Guests can relax in the leisure center which includes an 50 feet swimming pool, an indoor and outdoor hot tub, sauna and steam room. Free WiFi is available throughout. Each of its stunning rooms is styled with modern furniture, all rooms have a queen-size bed, a large 4-piece private bathroom, satellite TV, and blackout curtains. The Glaze Restaurant is AA Rosette-awarded, offering a unique setting for guests to enjoy modern British and Indian cuisine with stunning views of the lake and landscaped gardens. Agua Bar & Lounge is a relaxed and comfortable alternative serving light snacks and creative dishes with an outdoor terrace. Room service is also available 24 hours a day. The Quad Club offers keep up with your fitness regime with a variety of machines. The team of in-house beauty therapists provide a full menu of Monu and Jessica beauty treatments. The business facilities including 10 meeting rooms with the largest room accommodating up to 450 people. Free WiFi is available in each meeting room. The hotel is easily accessible from the M40, M4 and M25 motorways via the A404, and has free car parking. 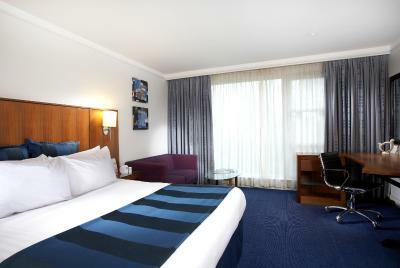 London, Oxford and Reading are all within a 30-minute drive of the hotel,as is Heathrow Airport. When would you like to stay at Crowne Plaza Marlow? Guests receive 24 hours of free Wi-Fi, and there is a TV with on-demand movies in each room. The Crowne Plaza's soothing aromatherapy spray helps you get a good night's sleep. Guests receive 24 hours of complimentary Wi-Fi, and there is a TV with on-demand movies. This room features a leather office chair and glass desk. Guests can use the Club Lounge, on the ground floor. This spacious suite has a separate living room, dining area and a private balcony. Guests can order meals 24 hours a day from the in-room dining menu or come to the Club Lounge for complimentary breakfast, drinks and snacks throughout the day. Guests can also enjoy 24 hours of complimentary WiFi. This room has a visual fire alarm and vibrating pillows. The bathroom has handrails and a roll-in shower with shower seat. This double room has a mini-bar, bathrobe and flat-screen TV. House Rules Crowne Plaza Marlow takes special requests – add in the next step! Crowne Plaza Marlow accepts these cards and reserves the right to temporarily hold an amount prior to arrival. The card used at the time of booking must be provided upon arrival. If guests are using satnav to find the hotel, use this alternative postcode: SL7 1LU. If you require an adjoining room, please contact the hotel after the booking for availability. Location is poor. Its located through an industrial estate close to a main road and railway line. A very long walk into Marlow centre!! Very poor service from evening restaurant staff. Extremely disorganised and clearly in need of better training and management. The standard of food was very average I suggest due to a much too wide a choice off the 4 different menus!! Clearly cooked from frozen with little care and attention to quality and presentation. The Hotel is also currently undergoing a rebuild and refurb programme. This was never revealed before we arrived at the property and resulted in no water in our rooms overnight, some noise, closed lounges and main restaurant with temporary breakfast and eating facilities being set up in the bar area. Very unprofessional not to have this made clear on their booking website. Only a 20 minute walk to the Marlow High Street and very scenic. Breakfast was very expensive (we didn't eat there) bar was expensive too. The restaurant service was not ideal. Twice, I was in but did not get serve and I just left.! Even though the hotel is going through a lot of renovation, the staff did everything in their power to ensure we had a nice stay. Had a really good night sleep. Very comfortable beds and pillows. 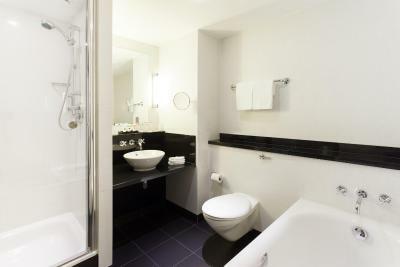 Nice bathroom with very good shower. 20+ minute wait for check in. Loss of original booking details booked via hotel directly. Lied to by staff...said they were fully booked and could not accommodate us before booking 2 rooms minutes later on Booking.com. Relocation of dining room into bar area due to redevelopment...bar lacking in comfortable seating and atmosphere. Hopeless bar staff...didn’t collect one glass from the table all evening. Prefer to chat rather than serve. Same poor quality service in morning over breakfast where staff were not attentive and not collecting used dishes. Room card keys continually failing. Having to return to reception every time we wanted to gain access into our room. Very annoying. The hotel is mid-refurbishment so the bar area is not ideal. The rooms, although clean and comfortable, are a little dated and tired in places. Building work at 9am on a Saturday morning close to my room. Large spacious room as I was given a room with two doubles instead of a standard double. Very comfortable bed! Free parking is great. Spa and pool facilities are good.